At SOS Admissions, we have built a reputation for ourselves as the foremost experts in admissions interview preparation. Some people call us “miracle workers” because of our ability to turn ordinarily shy, nervous, and awkward students into confident, polished, and outstanding interviewees. Our one-on-one interview coaching sessions are carried out by highly experienced professionals who have worked in admissions and have experience helping clients applying to top medical schools. If you want to create a great impression on your interviewer, SOS Admissions is the coach you need. We have helped hundreds of students successfully interview at highly competitive medical schools using both conventional and multiple mini interview (MMI) formats. We have been able to help clients secure admission into some of the most prestigious medical schools in the country. 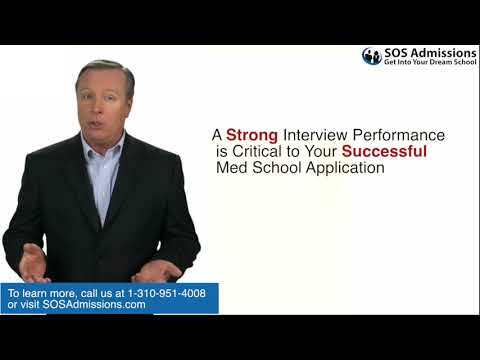 SOS Admissions has helped hundreds of medical school applicants successfully to get into medical school. You need more than an excellent educational, clinical, or research background to gain admission to the medical school of your dreams. You need a strong interview performance to get accepted. Some of the most qualified, intelligent applicants don’t gain admission because they either made the wrong impression or made no impression at all during their interviews. We can help you make the right impression. We have created a coaching system to give our clients the best possible admissions interview preparation in the shortest possible time. Applicants interviewing for conventional medical school admissions interviews (blind, open-file, or admission officer interviews) require a minimum two-hour session, but most clients request three to five hours. Clients for MMI coaching require a three-hour session. It will amaze you how just one interview coaching session can help you perform better in your interview. The lessons we teach will help you become more confident for the interview, and many of the skills we teach can be applied to other real-life scenarios, which will serve you for many years to come. Our Conventional Interview Coaching Package includes two hours of interview coaching for $475. Clients for MMI coaching require a three-hour session for $575.